I received a free Luxi mattress for review. 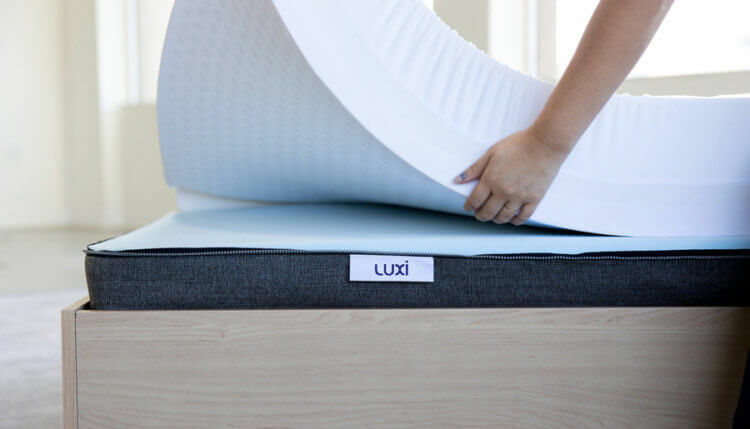 Luxi takes the risk out of buying a mattress online and has brought something truly unique to the market that has put them ahead of the pack. This post has previously shown up at the sleepsherpa.com main site but since this mattress is new to Australia, I now have the opportunity to talk about it again but to an Australian audience which may be new to the online mattress startup world. Luxi is one mattress that you can adjust to soft, medium or firm. Anytime. Luxi’s actually 9 mattresses in 1. That’s because if you buy a queen or king, the layers can be configured to be soft, medium or firm on each side for each sleeper. Don’t let this fool you, it’s not complicated and feels great. Luxi’s value is in it’s technology. If you’re looking to buy a mattress online, you get versatility with latex AND memory foam at a great price. The Luxi ordering process is fast and easy and similar to the Koala in that It arrives in a box at your doorstep in about a week and is ready to sleep on that night. Aside from the design of the mattress Luxi has a wonderful 100 night trial period. Below is a video of me showing how the Luxi works and why it’s such a unique mattress. The real value comes not only in the customizability but also the SBT layer which is completely new to the mattress space and offers unparalleled pressure relief. Below is a picture of the Luxi balancing layer also known as the SBT (support balancing technology) element. The idea is that each of these pieces will collapse a certain amount to provide just the right amount of pressure relief for each part of your body while still allowing room for air to circulate so that you don’t overheat. The SBT layer is my favorite part of this mattress. It’s is soft yet supportive and is very breathable. This design addresses the heat retention problems plagued by traditional foam mattresses. The SBT element was designed with years of mattress making experience and feedback from customers. Foam mattresses try and create softnes by adding layers but if you add too many layers the mattress will lose support and sag. The SBT Layer allows sleepers to sleep in any position and still get the support they need without the pressure! This is also a big reason why I like shredded foam an latex pillows. The aggregate of the shredded pieces makes for more contouring and promotes more air flow. Below is a video of it in action. This is the most versatile mattress I have reviewed. Buying a mattress online can feel like a roll of the dice but with Luxi you greatly reduce your chances of getting the wrong mattress because it really is multiple mattresses in one. Couples that have different firmness preferences would really stand to benefit from the Luxi because if you buy a queen or king size Luxi, you can configure each side differently. That means if your partner prefers firm and you prefer the soft SBT layer, everyone wins! Your firmness preference may change over time. Life changes such as pregnancy and aging can make you prefer a softer mattress. You can make those changes with your existing Luxi without any extra purchase. It’s amazing the range of firmness you can get out of one mattress. Luxi also has wonderful edge support, even on the SBT layer. There is border around the SBT layer of dense foam that keeps you from feeling like you will roll of the bed which is another major complaint among memory foam owners. The Luxi makes for an extremely verstaile bed. That’s because it’s so easy to customize to a sleeper’s firmness preferences. Each firmness setting has a unique feel. Sleeping on the medium firm layer of the Luxi feels a lot like sleeping on the Koala mattress because they both use latex. However, unlike the Koala, you have two additional firmness options reducing the change that you will return the mattress because you will likely find the firmness the best suits you. Switching firmnesses is a breeze. It takes less than 5 minutes to unzip the cover and flip over a layer to get the firmness you desire. The obviously makes the Luxi the ultimate guest mattress too since your guests will be able to choose the best configuration. Luxi founder, David Farley has an extensive background in the mattress space and he has put all his expertise into this mattress and it shows. There are many new online mattress startups coming to Australia however Luxi is the first mattress to bring something innovative to market.